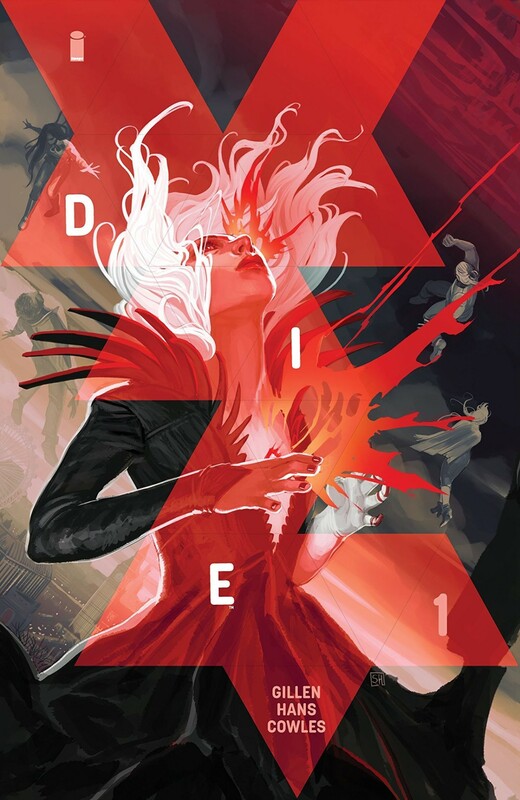 Die, the new ongoing fantasy comic from writer Kieron Gillen and artist Stephanie Hans, follows a group of five adults forced to revisit the horrific world they fled in their youth after playing a mystical role-playing game. What purpose does fantasy serve? The term refers to a body of speculative fiction, with epics set in fantastic universes inspired not only by medieval history, but the folklore and myths of countless cultures and generations. For many, the utility of fantasy lies in its affordance as allegory: the genre’s potential to refract reality through the prism of fiction, revealing the inherent truths within the stories we tell ourselves. One of the genre’s bedrock works, J.R.R. Tolkien’s The Lord of the Rings, can be viewed as a sweeping war epic divorced from reality. Those who recognize Tolkien’s tour as a second lieutenant in World War I (including such brutal events as the Battle of the Somme) know that his pantheon of hobbits, orcs, and elves ascend from a far more visceral and haunting foundation. For other fans, fantasy offers a means of “escape,” a genre that affords a suspension— rather than refraction—of reality, providing distance and entertainment from the parade of troubling headlines causing global dissonance. As Stephen King once so eloquently said, “A good story has the power... to take us away to worlds that never existed, in the company of people we wish we were… or thank God we aren't." But what happens when fantasy, the means through which we mask and escape, becomes the very thing we’re so desperate to escape from? This question and more haunt the pages of the first issue of Die, the latest series from The Wicked + The Divine writer Kieron Gillen, digital painter Stephanie Hans, and veteran letterer Clayton Cowles. One night in 1991, six teenagers sit down to indulge in a role-playing game session at a joint 16th birthday party. That same night, the sextet disappears without a trace. No clues, no explanation, no leads to suggest their whereabouts. Two years later, the so-called “Stafford Six,” minus one, apparate on the outskirts of their hometown, either oblivious or refusing to acknowledge what transpired since or how they disappeared—or why one of them is missing an arm. 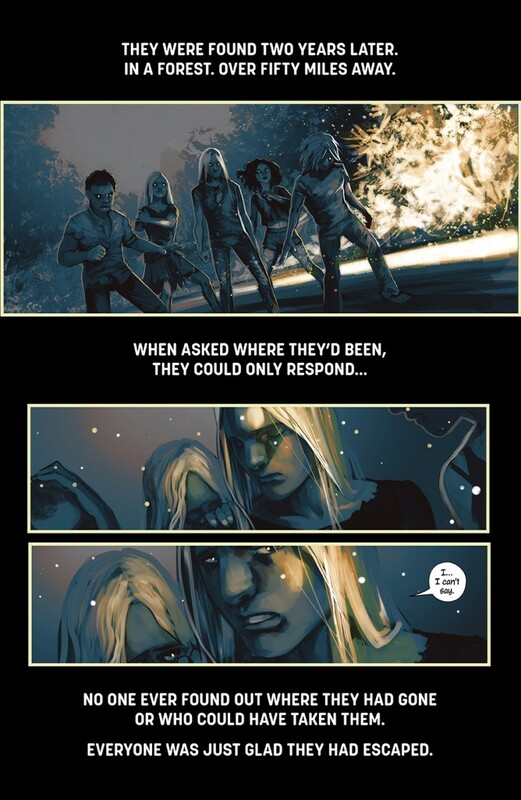 Die is the story of these five friends, now adults in their 40s, as they descend backward into the world of high fantasy and despair that stole them away so many years ago on a quest not only for resolution, but absolution from their respective traumas. An intensely meta horror-fantasy epic of deeply personal stakes, Gillen has half-jokingly described Die as “Goth Jumanji” by way of It, a whimsical yet apt description that offers only a sliver of what the series has to offer. 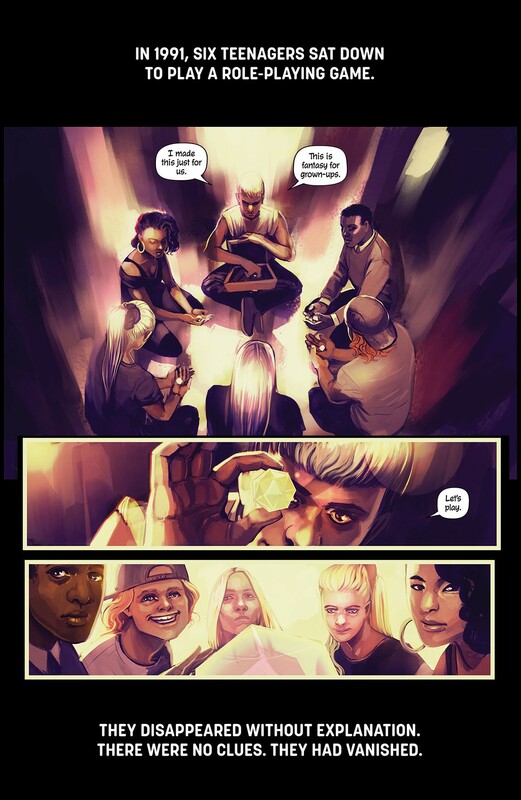 The first long-form creator-owned series from Gillen following his work on The Wicked + The Divine and Hans’ first ongoing series, Die finds its creators at a crossroads—both in their respective careers and lives—as they channel a story that balances the promise of what fantasies can offer with the perils of what they can take away. Die is a lifeline, both in a support to myself, but also a literal line of my life, stretching onwards and back. I’m going to hold onto it, white-knuckled. The origins behind Die stem from Gillen and Hans’ shared love of tabletop role-playing games. For Gillen, who remembers when the Dungeons & Dragons Red Box launched in 1983, role-playing games were as aspirational as they were elusive in his youth. A love of gaming isn’t the only fuel behind Die’s creation, but it has manifested as a related—yet distinct—game itself. 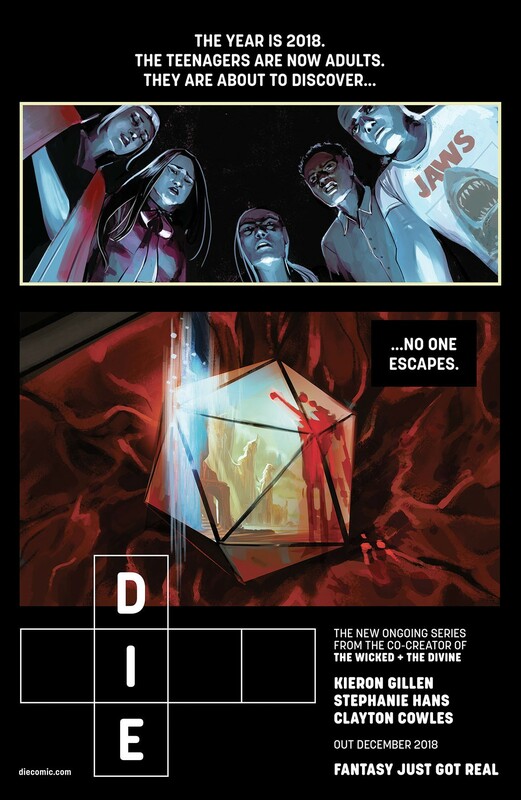 In the comic, the Stafford Six are inexplicably transported into an otherworldly plane through the crystalline dice (singular, die) gamemaster Solomon assigns. In the process of researching for the comic, Gillen designed that RPG himself. An aficionado of the medium, Gillen pulls from his experiences with such games as Monsterhearts, Fiasco, Dungeon World, Legacy: Life Among the Ruins, Cyberpunk 2020, Vampire, Paranoia, and Warhammer Fantasy Roleplay (3rd Edition) to define the mechanics of his game and, by extension, the world of Die. Yes, I’ve done a classical me and went in far too deep, designing the RPG system of the comic and developed it in parallel. I plan to release the first take of the RPG as a PDF when the first trade comes out. You remember the old navigator maps from Medieval times where—when people didn’t know what would be beside a certain point—they would draw monsters? The reality today is that there are no places anymore for monsters to hide, beside some folklore, disappearing fast, and frankly, I find the world sadder and smaller without them. While Die is the culmination of a great and many number of inspirations, it’s ultimately a story of what art does to humans and how humans grow—or regress—through art, and what humans do with art.